Minecraft is something of a smash hit, having sold over 30 million copies since its launch a few years back. The game is currently being ported to the PS3, PS4, PS Vita and Xbox One — and, if a new rumour is to be believed, the Wii U. The source is a retailer who has previously shared inside information with Nintendo Enthusiast, so it might be wise to take this with a fairly large bag of salt. 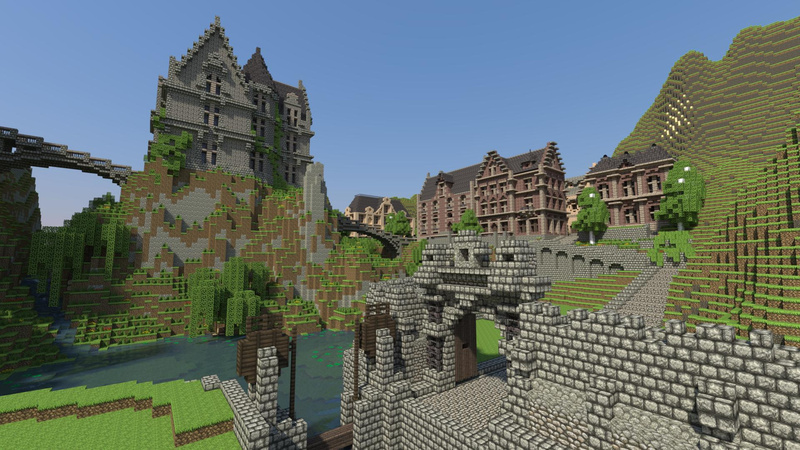 According to the source, Minecraft studio Mojang has taken possession of Wii U developer kits — although quite how a retailer would know this kind of information is unclear — and the game will make heavy use of the GamePad. Nintendo's Dan Adelman and Damon Baker have previously stated that they have a "continuing relationship" with Mojang, so getting Minecraft on the Wii U is clearly one of the company's aims. However, whether or not you believe that is actually happening right now depends on how much stock you place in this mysterious retail "source". Let us know what your gut feeling is, and how much you'd love to play Minecraft on your GamePad. I'm not into Minecraft myself, but this is a hugely popular game that Wii U really needs. I hope it's coming. End of year as in next week or Dec 2014? I honestly wouldn't be too surprised if we see this before December's out. The PS3 port just went up and that came completely out of the blue. I'm not into Minecraft, but if they put it on the Wii U and emphasize the GamePad, they'll have a mega system seller on their hands. Please be true, please, I'd buy it day one! @NINTENthusiast But how can Mojang have dev kits if a different studios handles the console ports? @Damianmer @NINTENthusiast That was a personal mistake. I was told "the company" and assumed it meant Mojang. I've never actually played Minecraft. In fact, I have no idea who the developer is based on what I was told. It could be 4J or it could be someone else entirely, commissioned by Nintendo." Not really into Minecraft that much but it would be interesting for gamers if one does come out for Wii U. It'd be nice if you meant by the end of /this/ year. I think it should happen. It's getting a lot of demand. Never played it but would be willing to give it ago as only heard good things about this game. A 3rd party title utilizing the gamepad well? Count me in! Minecraft for the Wii U would be BIG! Well, why not? I never played Minecraft, but I love walking through beautifully crafted worlds - and some Minecrafters really know how to impress! Just one question: do the PC and Console versions have separate servers or can X360/PS3 players access PC originated worlds and vice versa? I game on my Wii U and 3DS except for two (well three) games: Minecraft and Left 4 Dead 1/2. So I would love to see Minecraft on the Wii U. Wonderful if it would support crossplay on PC-servers but alas, that will probably not happen. I can see it on the Wii U since they're putting it everywhere, but wouldn't believe a word of that article. Retailers don't get told insider information on games development. The fact they claim it comes out before the end of the year just confirms that for me. Whenever retailers put a game in their system, it requires a date. When there's no official date, they always put 31st December. How would Minecraft help sell any Wii U's though? It' out on EVERYTHING. If someone wants to play Minecraft, they already have something that can play it. Nobody is gonna buy a £250 console for it. I hope this is true. Maybe I will hold off getting the PS3 version. Minecraft with Nintendo stuff in would be a miracle!!!!!!!!!! @Peach64 Well if you think of Rayman Legends which is pretty much multiplatform, you'll find out that Legends is better on Wii U. I think with Minecraft + Nintendo characters + Miiverse would do wonders.....think about it. Even better would be a 3DS version... in 3D! Yes, all the yes, all of my yes, all of it. I might buy a Wii U version, but I'm not sure what it could offer that the PC version doesn't, other than off-TV play. Personally I'd rather have a 3DS version in 3D. @Peach64 I don't think anyone expects Minecraft to be a system seller. No one has said so (unless I missed it in the comments), so I fail to see how this is even relevant. To be honest, Minecraft with MiiVerse supprot and off-TV play would be BIG, especially MiiVerse. But they would advertise that thing way way more, its Minecraft afterall. Who doesnt want to tell people that a certain system doesnt have minecraft. Like always, dont get your hopes up, but wait and see. I think Mojang said they wouldn't port it to to Wii U (around the same time as saying they wouldn't port it to PS3) so who knows. It would be good for a gamepad showcase but I am pretty sure the kids that have made it a success will have moved on by the time any more versions come out. If they're making a Vita version, they obviously don't care too much about massive sales figures so I'm not writing off a Wii U version. Never played it, but would consider it for the U if it came out. You'd think the combination of Wiimote and Gamepad would be a stellar interface for it really. This is BS. How would a store clerk know this? I met plenty of "sales associates" that knows the developer of this and that game... I'm sure everyone at NL spoke to a GAME or Gamestop employee that told them all this great insider stuff. As the article suggests, take this with a bag of salt... I say upgrade it and take this info with a very large salt mine. I tried to play Minecraft on PC once & didn't find it very accessible or fun, I had no idea what the icons did & dug myself into a big hole by mistake, never could get out of it & then I never played Minecraft again. Too little, too late. I love Minecraft and will play it on pretty much any platform they'll give it to me on, but I'm only gonna buy the game so many times. Wii U is the platform I really want it on, but I already have it on PC, PS3, Android, and by the time it ever shows its face on Wii U, I'll most likely have it on Vita as well. the game has been around for a long time now, across multiple platforms. I think any who wants to play it, has. No one is specifically waiting for a hypothetical Wii U version. Will be considered if it comes to the U. @EvisceratorX They actually announced a Vita, PS3 and PS4 version at E3 this year with the PS4 version coming out when the console did. Someone made a guess. The person making said guess had no real inside information, therefore it was just that, a guess. The chance of Minecraft being developed for Wii U is the same as it ever was. As for whether or not I'd buy it; probably not, I already own the PC version. Not much point in buying a console version of the game when you own it. The gamepad could easily make this the best console version, if it actually gets made. Minecraft could single handedly pull the WiiU from the sinkhole it's in. If you can say the WiiU and gamepad caters to one particular type of gaming experience, it would be Minecraft. I really, really hope this is true. Having someone play on the gamepad and one on the Tv would be outstanding. I'd puchase this if that ends up the case. I have never played minecraft but if it came to the Wii U I would definitely pick it up. The PS3 version just came out - 18 months after the Xbox360 version - so Minecraft could come out on the Wii U, but I don't think they're in any rush. If I were them, I'ld wait to see how Wii U sales go this holiday, then port it to the 2/3DS. Sure, go ahead and make it. My only thought is that it will be a downgrade for the pc so really pointless to me. But that gamepad, that would be cool to use in Minecraft. if it's anything like the other console versions it will have better network code and local co-op, plus be coded in c++. I like the mods on pc, but if they use the gamepad well, I'll be happy to buy the game for a third time. I'm not into Minecraft anymore, but I hope they release this on Wii U. This would be nice on Wii U - the Game Pad could be your inventory - you'd never have to pause. If this arrives December 2014 then it is well over it's expiry date and the Minecraft hype will have blown over for the larger part. Besides that, I do not think it is all that special to begin with, so I don't care either way. Mind you, objectively speaking it would be good for yet another third party game to be published for the Wii U, so from that perspective it should be made. I have no interest in it, but my daughter recently bought it for her iPad and my partner's kids like it so I would probably buy it for them. Let me guess. This is going to be the "definitive version" of the game. Well, I've never played Minecraft, and still don't know what it's about (I'll have to check it out), but it is a mighty fine gesture of them to bring it to the Wii U,even though chances are that people who are even marginally interested in it have it for something else.I may just end up getting it on Vita since I can take it everywhere with me. not a big fan of minecraft, but i've checked it out before. they'd obviously use the gamepad well, so i'd probably buy it for that reason. Depends on price, for my purchase. I think it would use the gamepad in a cool way. Minecraft would be perfect on the Wii u, due to the gamepad. This game has sold over 30 million units. It's HUGE with kids. Of all the mega popular 3rd party games Nintendo can secure for the console, this would probably the best fit for the Wii U.
thats just me though, blue blue. As much as I want it to come to Wii U, I probably wouldn't end up buying it, as it would have a limited map like on 360. If I'm going to play, I want a limitless world to play in. If it's a year away, what's the point? If that's part of the rumour, it's probably not true either, the Wii U runs java, so a PC port wouldn't be hard to make where as both the 360 and PS3 had to be build from the ground. I've heard of Minecraft, I've seen my kids play the demo on the PC, but I dont understand what the game is about. It just looks like some retro 16bit demo. As soon as I mentioned this to my kids they shouted "Can you get it, can you get it!" What is Minecraft about? Is it an RPG or adventure game? Oh man, I never even thought of how perfect the game pad would be for Minecraft! Using the touch screen to place blocks without all the other controls squished in there like the pocket version... Sounds good to me! Fingers crossed, the Wii U needs Minecraft. I mean, it's even on Raspberry Pi! Now, if this is true, I'll hope for a 3DS version. Already bought this game on Xbox and was disappointed, just not as fun as I expected. Really cool it's coming to Wii U though for those who haven't experienced they might be in for a treat. There is nothing wrong with Minecraft on Wii U, I just don't see why you would choose to play on anything other than PC unless your PC is super terrible. PC is the most up to date version and has mods like Optifine to improve the performance dramatically (that the game developers cannot implement for themselves for some unknown reason), as well as other mods to suit your own tastes, texture packs, and downloadable maps. This will not sell systems, but it is one of many multiplatform games the WiiU needs to be a viable platform. It's a step in the right direction, and if they add Nintendo themes it will actually sell some copies. Could make a major influence on deciding what console to buy for people about to commit to a home console purchase, especially for younger generations who primarily play and enjoy Minecraft on a very regular basis. I would imagine it will do very well if the game is available. I welcome it. I have only one thing to say about this and it's "TAKE MY MONEY!" I would definitely pre-order it! I would then have to also buy the 8 hour battery for the game pad. ....Meh, already have it on PC...don't play it as much, so...yeah...if I can download it for free then maybe. @Kamalot Unfortunately, we are about 1 GB of RAM short of being able to play it even mildly well. Actually, there are infinite people (kids in particular) who love Minecraft, and I've heard quite a few say they'd only want a next gen console if it had Minecraft on it. Go onto Miiverse- there's kids plastering Nintendo's announcement section about wanting the game (not sure how much good that'll do but the point is that game is very important to alot of people). Cost is irrelevant. When we're talking kids, that means parents buy the console. If they'd buy an X1 for $500, don't think for a second no one will spend $300 for a Wii U. All it takes is the game being on the console, and an entire army of Minecraft fanatics will start looking at the Wii U as a viable option, especially if the Gamepad is used to create something unique that's not found on other consoles. Now just wait as someone comes to tell you how stupid and ignorant that excuse is since you can hook up a gamepad to PCs too. Not sure how viable that is for Minecraft though there are other reasons to buy another version instead. Maybe some parents don't want their kids hogging the computer. They could buy/build them their own, but that opens a whole other can o' worms, especially with younger kids. Besides that not many parents would go to those lengths just so their kids can play what they're told is the "best" version, and most young kids won't really care about the things that make it so anyway. In regards to the article, I wouldn't be surprised, but everyone will be tight lipped until they're ready to announce something. This is the sort of game that basically NEEDS to be cross platform. People on Wii U, Xbox One, and PS4 should be able to play this if it's not exclusive. As to people saying that Wii U can't handle it, think about what this game is. Blocks, very little going on in the game unless you make it so, graphics aren't demanding at all, etc. This game isn't very demanding. The only reason why Xbox 360 can't handle the PC version, is because Xbox 360 is 8 years old, already. Wii U is only 1 year old, and it has newer tech from 2011. It still confuses me how people don't understand that Wii U is a VERY modern machine. Well.. I definitely saw this one coming. It'll definitely sell well. @Kaze_Memaryu No, from what I heard console minecraft does not have separate single and Multiplayer modes. You create a world and you can have friends join or you can join your friend's world in console versions. On PC you have to have one computer host the server for multiplayer. The single player world and multiplayer are separate. Downsides to each version is that the console minecrafts are behind in updates and has no mods. The PC version doesn't have the merged single and multiplayer feature. if and when it does then i will buy the wii u version, if its not coming to wii u (which its most likely the case) then im staying away from minecraft, never played it but i wont go near it should this rumor be one of those troll rumors. If it is being developed for other consoles, this rumour is not at all far fetched. After spending hundreds of hours playing PC Minecraft, I will gladly spend countless more on this. Hallelujah! This is my second most wanted Wii U port of a game I already own (after GTA V), although I know Minecraft would sell more, so it's a better business decision. Well, for me it would just be a downgrade from the PC version(I never play the game without a HD shaders mod any more ), but I imagine that something like using the GamePad for the inventory screen would be fantastic(especially in Creative Mode). It'd essentially let you use all your items as if they were all in your item slots. I'd like to see it, even though I prefer the PC version, but I'm not holding my breath since I don't trust the source. Hmmm yes please! Minecraft should be everywhere, with cross play to everything! I get what you're saying, but Wii U is more capable than last gen anyway. 7th gen ports are no way to judge the Wii U. It's fact. Well, if they bring it to my favourite home console, it might get me interested. Makes sense, too. It won't cost too much to pull off, and it will make them some more money. I...don't think we should take this as anything more than rumor, but when questioned semi-recently about why Minecraft wasn't on WiiU, Notch said something like "Why not?" so maybe their previous stance of "very unlikely" has become somewhat more likely. Who knows? Never played mine craft but did giggle my donkey off when Athene made a video about minecraft... all these people making giant willies in game. His reactions made me laugh so hard. Athenewins peniscraft on YouTube. Warning for the kids, there is some language in the video... but this is the internet. It'd be cool to see MineCraft on the Wii U as I think the gamepad controls would do wonders for the crafting mechanic that had to be cut back for the 360 and PS3 releases. That said, I would only seriously consider this if it offered more than the other cut down console versions, such as expansive worlds (not size-limited to a certain region) and the newer PC features that were dropped to get those versions out the door. I already have the 360 version, but Minecraft + Gamepad is a win! @Senario Ahhh, good to know! Thanks a lot for the insight! The 360 version was a huge disappointment, as it was several updates behind and was very much limited in comparison to the proper version. Somehow I think Minecraft will only truly work properly on a computer. No! I don't want that accursed game on the Wii U! So boring! I would happily try Minecraft on Wii U. Seems like the GamePad could work really well with building. I would get it on the 3ds if it came out on it. Nintendo needs to follow the trail of autism that the other platforms left behind. "I agree a Wii U version would make sense, btw. The only reason for no current plans is we've got too much work already. I <3 Nintendo." Notch just said on Twitter (along with, before that, "I am not aware of any plans to release a Wii U version of Minecraft."). so I guess that lays this to rest, absolutely. @SageWaterDragon the WiiU is? It has more RAM than an X-Box 360, yes? If X-Box 360 can run that version, I'm sure WiiU can as well. Notch and Mojang love money so businesswise it would be absolutely a bad decision not to do a version for Wii U. Why turn down option to make more money? I suspect it will come during next year, most likely before summer. The Wii U tablet will be perfect for Minecraft since it uses a lot of menus for the items and crafting. what about the 3ds .n. Budget and Pro versions incoming?